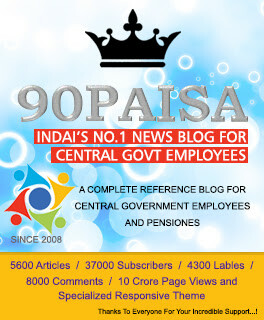 The Fifth Central Pay Commission had recommended uniform neutralization of DA at 100% to employees at all levels and increase in DA calculation too, according to the 12 monthly average of AICPIN for Industrial Workers (1982=100) as on 1st January 1996, of 306.33. The Linking Factor of 303.33 has now changed to 115.76. This was calculated as 4.63 in the 4th CPC. It was due to this change that the Dearness Allowance has increased in recent years. The 6th Pay Commission had promptly calculated it and said that the true impact of price rise and inflation would only then be known. It was also mentioned in the recommendations made by the 6th CPC that each time the Dearness Allowance touched 50%, certain Allowances and Advances should also be raised by 25%. It is of common knowledge that according to these recommendations, when D.A touched 50% on 01.01.2011, DOPT issued orders to increase it by 25%. Since the DA is calculated on the basis of price rise and inflation, this 25% raise was given in order to make it uniformly applicable to all the other Allowances and Advances. The Allowances and Advances mentioned in this are the Children’s Education Allowance and Hostel Subsidy and Festival Advance. As of now, the Central Government employee is entitled to claim 15,000 per annum per child under the Children’s Education Allowance and Hostel Subsidy. An increase of 25% would mean that the amount would rise to Rs. 18,000 per year. Similarly, there are chances that the Festival Advance would increase to Rs. 4500. These could be confirmed only after the DOPT makes its official announcements. 2. Advances for purchase of Bicycle Advacne, Warm clothing Advance, Festival Advance, Natural Calamity Advance Fin.Min. 3. Special Compensatory Hill Area Allowance Fin.Min. 4. Special CompensatoryScheduled / Tribal Area Allowance Fin.Min. 6. Speical Compensatory (Remote Locality) Allowance Fin.Min. 7. Cycle Maintenance Allowance Fin.Min. 8. Mileage for road journey all components of daily allowance on tour, rate of transportation of personal effects. Fin.Min. 9. Rates of Conveyance Allowance under SR-25 Fin.Min. 11. Split Duty Allowance Fin.Min. 17. Bad Climate Allowance Fin.Min.